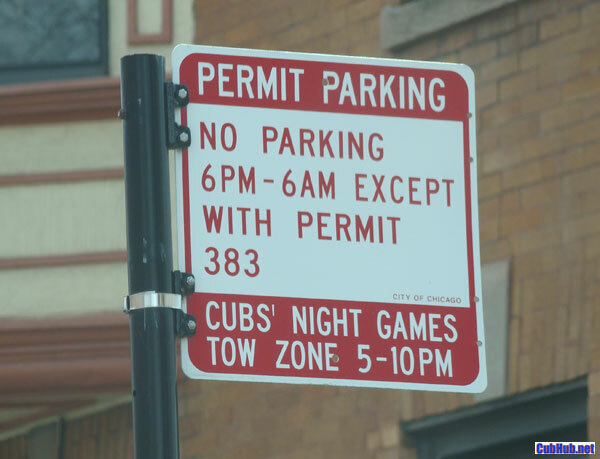 With the City of Chicago’s privatization of parking meter street parking, and the longtime restrictions of permit-based night game parking in Wrigleyville, it is advisable to plan your Cubs game parking in advance. Make no mistake, if you park illegally, there is a city tow truck waiting nearby to ruin your game day experience. They charge you the parking fine, plus towing and storage costs. Add in the cab fare to retreive your vehicle and your special day is ruined. No need to take that chance, Cub fan. A returning sponsor to CubHub.net is ParkForWrigley.com, a unit of one of the largest parking operators in the country, Standard Parking. Through the ParkForWrigley website, you can purchase your game day parking in advance. No worries about paying exhorbitant rates or getting ripped off by paying someone to park somewhere they don’t have rights to sell. Or getting shut out when the lots nearby Wrigley Field are full, sending you on your way to improvise. Especially for fans who don’t know the neighborhood well, it’s a safe bet to buy your parking in advance and know your car is in a safe, authorized place while you enjoy the game. Go to ParkForWrigley.com to buy your parking spot up to one hour prior to game time, and enjoy the game! ParkForWrigley provides you the opportunity to purchase event parking for Chicago Cubs home games and other Wrigleyville events in advance. Our state-of-the-art system allows you to pay for parking online and print out your access barcode, saving you the time, expense and headache of trying to find parking on the way to the ballpark. All available parking is conveniently located near Wrigley Field in Standard Parking™ managed self-park facilities.